When we create the Enhanced Editions, we get the opportunity to design new content in addition to updating graphics/interface and fixing issues. Creating new items is especially fun. Nothing's worse than fighting a boss monster only to get a generic +1 longsword and some potions off the body. 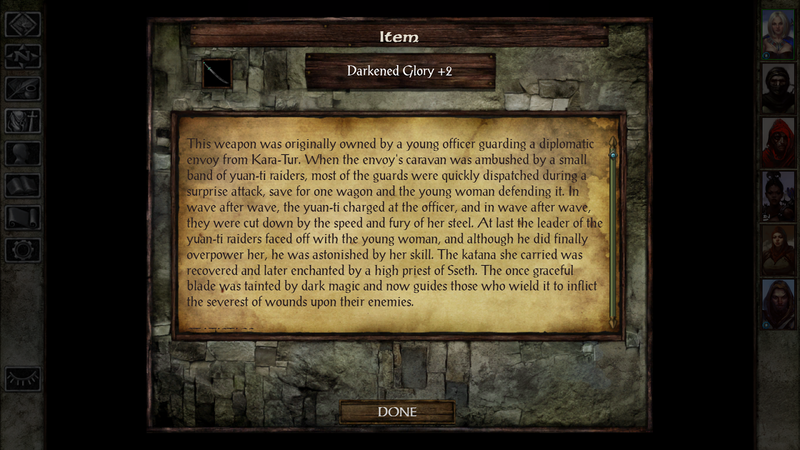 Unique items add interest to the game and item lore can deepen the world. When we create new items, we consider two main points. Today on the Beamblog we'll go over these points and showcase some of our Enhanced Edition items. Item placement refers to two principles: what challenges need to be overcome to obtain the item, and at what point in the game the item should be found. Both these principles inform how powerful the item should be. If an item appears early in the game, unguarded, in an unlocked treasure chest, it probably shouldn't be a holy avenger. If an item appears late in the game behind a wall of red dragons, in a trapped treasure chest that can only be opened by solving a riddle, it probably shouldn't be a potion of healing. It's important to consider where items of particular types appear in the game as well. If all the magical halberds are extremely powerful and appear at the end of the game, players who specialize in halberds will feel cheated (or will switch to a different specialization far before they reach the end of the game). It's important to place a good variety of items in each chapter. Item balance refers to the item's powers and how they relate to other items placed similarly in the game. Balancing the power of an item is something of an art. It seems obvious that items shouldn't have “too many” good abilities, but how many is too many (and for that matter, which abilities are “good”), is less clear. A +1 dagger that becomes a +4 dagger against badgers might seem like a terrible weapon, but if the designers know there's an all-badger dungeon coming up, it turns into a great item. When we add powers to new items, we consider what other items in the same area of roughly the same importance can do. We try not to overlap abilities (in other words, we don't want a +1 longsword of flame and a +1 halberd of flame and a +1 dagger of flame all in the same area). Items that protect against specific spells are less powerful than items that protect against blanket status effects—that's the difference between a cloak that protects the wearer from hold person and one that protects the wearer from paralysis. Items that grant ability score or Luck increases must be designed carefully, as those are some of the most powerful bonuses available. Powerful items aren't bad items, as long as they are placed properly. Item design requires writers, artists, and programmers to work together to create a memorable and useful item with a distinct appearance and a place in the world. The new items that appear in the Enhanced Edition games fill in some holes where items were needed and let us add a bit to the lore of the world. Below are three of our home-brewed items. This weapon was originally owned by a young officer guarding a diplomatic envoy from Kara-Tur. When the envoy's caravan was ambushed by a small band of yuan-ti raiders, most of the guards were quickly dispatched during a surprise attack, save for one wagon and the young woman defending it. In wave after wave, the yuan-ti charged at the officer, and in wave after wave they were cut down by the speed and fury of her steel. At last the leader of the yuan-ti raiders faced off with the young woman, and although he did finally overpower her, he was astonished by her skill. The katana she carried was recovered and later enchanted by a high priest of Sseth. The once graceful blade was tainted by dark magic and now guides those who wield it to inflict the severest of wounds upon their enemies. Lin Mei was described as a woman of exquisite beauty and a hellish temper. When her family urged her to find a husband, she issued a challenge to the men of the land: Whoever could make her yield in single combat could have her hand. The suitors gathered from all across Kara-Tur to test their skill, and although she fought with no weapons but her open hands, she bested every single one of them. Disappointed, all suitors left but one—a young man with kind eyes and a pair of gilded bracers, which he presented to her as a gift. "No one can hope to tame your passions," he said, "and those who would try will never understand your heart. May these trinkets serve as a reminder that your temper is your own and not to be controlled." Lin Mei did not marry that man, but she left home with him that day to seek adventure, and together they spent the rest of their lives in closer partnership than any husband and wife. Eventually the pair retired, and Lin Mei quietly disappeared from the annals of history. All that remains of her story are the bracers she wore, still burning with the fire of her untamed passion. This ostentatious peacock-blue hat is festooned with green and purple feathers. Once the possession of an unfailingly chipper bard, the hat was stolen when the bard couldn't resist showing off the hat in a seedy tavern and bragging about its magical powers. In truth the hat has only moderate enchantments on it, but its stylish appearance makes it a coveted choice for many bards. Wait, that last one isn't in any of our games. How did it get on the list? Aha, it's from Adventure Y! That explains it. We hope you enjoyed this look at how items are designed (and the sneak peek of the Adventure Y bard hat). Check back next week for a new Beamblog post.